In the locality of San Gabriele you can find this wide rural area characterized by wet meadows, hedges and thickets. 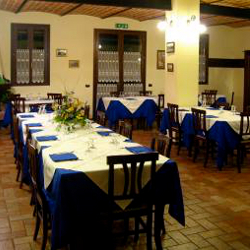 The restaurant offers traditional dishes like "tortellini" (fresh pasta with meat filling), "lasagne", "tagliatelle" (hand made noodles), but also dishes of wild game like "maltagliati" pasta with malllard sauce, "pappardelle" (large hand-made noodles) with hare or wild boar, hare stew, pheasant and fagiano and quail. Every Sunday evening it is possible to eat "crescentine" (fried dumplings) with cold cuts and grilled meat. The restaurant service is temporarily suspended.